Why do we work five days a week? We all grew up with the five-day workweek as standard practice. We roll into work on Monday, work uphill to Wednesday, then work down the other side of the mountain to Friday afternoon. Our weekend, Saturday and Sunday, are a time of rest … well that is the theory. Manufacturing lead the charge many years ago to standardize a five-day work week. So much the better to manage the workforce. Yet, is this the way of work forever? For many industries the time may be right to reconsider the five-day workweek. Some business leaders are experimenting with a four-day workweek and the results are impressive. CNN has a terrific opinion piece on the topic titled, “Why four-day workweeks are best“. I invite you to read this article for more detail and insight. A four-day workweek is not for all industries, but where it is possible, it can and does work. A key learning – everyone in the organization has to be involved. 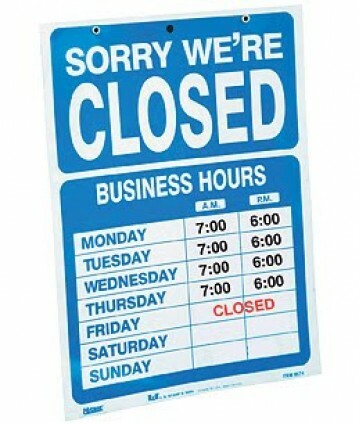 We open for business Monday morning and close Thursday evening. This is very different from a compressed work schedule where employees work four 10 hour days. With this approach the business is open that fifth day while you are out of the office. Research shows that many employees, fearful of being out of the loop, work part of that compressed day off. Indeed the new thinking is we all work four regular eight-hour days and close the office for three days. Less time in the office means everyone needs to focus, collaborate and get the job done. Employees tend to take less time off for appointments and “mental health” days in this environment. People focus more at work due to the concentration of time and production improves. With the added time off, employees have more time to unwind and explore other pursuits that allow them to grow and maintain a healthy outlook. People are more refreshed returning to work. If I was implementing a four-day workweek in my organization I would add an important ritual to start the week … the team huddle. How powerful to gather everyone Monday morning and both welcome everyone back and review the week ahead. To focus everyone on the tasks at hand and the deliverables needed by the end of business … on Thursday. Then we close the week with another ritual. A gathering to review status and accomplishments and set up the next production week. We end Thursday with best wishes for the next three days away from the office. Yea, my head is in the clouds today. Yet, I do not think this is wishful thinking. More organizations are exploring the four-day workweek. Change will only happen if we broaden this conversation. Henry Ford was instrumental in establishing the five-day work week. It is time for new business leaders to innovate and revolutionize how, and when, we gather to produce and create.